Today is our third birthday! We're pretty excited. Tonight Mom is going to let us have our birthday Happy Hearts cookies and Dad is going to pick us each up McDonalds ice cream cones on his way home from work. Mom says we even have some presents! 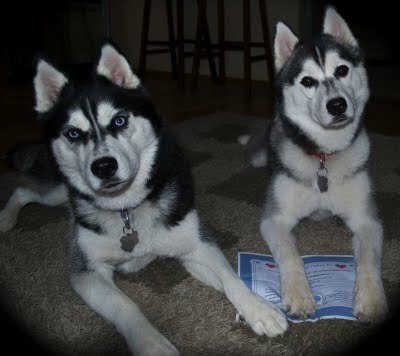 Speaking of presents, the first birthday present we received was from two of our bestest buds, Phantom and Thunder. 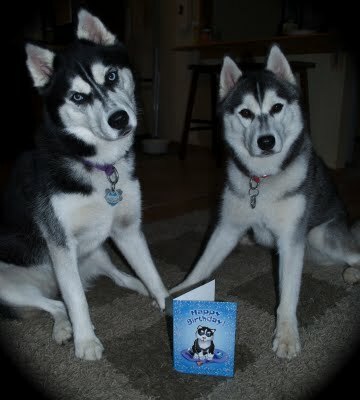 They sent us this really cute card, which is one of Jack's mom's cards. It's pretty perfect for us as the puppy on the front looks sort of like Kat! Thanks so much Phantom and Thunder! (Kat says especially you, Thunder.) We are really honored that you thought of us on our birthday. Hey Thunder, how's life being three? Any tips? PS. Happy Birthday to our Missouri grandpa too! Isn't it cool that we share a birthday with our grandpa?